The Colonial Legacies Field School in South Africa is a three-week experiential-learning course taking place in rural and urban South Africa. The Ethnohistory Field School is an opportunity for graduate students to live and work in partnership with the Stó:lō First Nations. The Colonial Legacies Field School in South Africa gives all third- and fourth-year students the chance to learn about how history is impacting communities today. The Ethnohistory Field School is a fabulous opportunity for history and other graduate students to live and work in partnership with the Stó:lō – the indigenous people who have made the Fraser River Valley and Fraser River Canyon home for thousands of years. It is a partnership between the University of Victoria, the University of Saskatchewan, the Stó:lō Research and Resource Management Centre, Stó:lō Nation and the Stó:lō Tribal Council. Every second spring since 1998 graduate students and faculty from the Universities of Victoria and (since 2002) Saskatchewan move into Stó:lō territory, board for a week with Stó:lō families, and live the rest of the month-long field period in a longhouse. Working together with Stó:lō mentors, staff and elders, students work on a research project that the Stó:lō have identified as important to them. For the student participants, this kind of hands-on, participatory, live-in-the-community research is education in its truest sense. Students not only learn about history and ethnohistorical methods (which are practical and employment skills) their worlds are expanded, attitudes transformed and relationships forged. 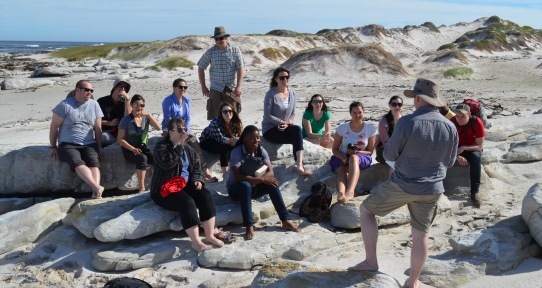 A 3-unit experiential-learning course taking place in rural and urban South Africa. Spend three weeks in South Africa and learn on-the-ground about impacts of colonial histories in everyday life and on rural and urban landscapes; sustainable rural development; apartheid and reconciliation; grassroots anti-poverty initiatives; community responses to HIV/AIDS; gender and development; land, labour and global economy; modes of historical memory. Third and fourth year students from all disciplines are welcome to apply.